Get control of your messages in OS X's Mail, iCloud, and Gmail. While email is slowly being replaced by other forms of communication such as text messaging, or services like Slack, it is still the main way people do business. The average user receives about 90 emails per day, a dozen of which are spam. To help work efficiently with email, it’s a good idea to filter some of your messages. You may want to have separate mailboxes for your work and personal emails, or specific mailboxes for emails from close friends. If you’re using email for business, you may want to filter emails by client, or put support emails in one mailbox, and sales queries in another. There are many ways to filter email: in some cases you can filter your email directly on a server, so filtered messages don’t go into your inbox at all, making it easier to deal with email on your iOS device. And you can filter email on your Mac, in your email program. In this article, I’ll look at filtering email on iCloud and Gmail, two of the most popular email services, and explain how you can create filters in Mail. It’s easy to set up filters, and it can make your email life a lot easier. Create a new mailbox on iCloud. Click OK, and you’ll have a new mailbox both on the server, and in Mail. You’ll be able to move messages there from within Mail, in the iOS Mail app, and on iCloud.com. 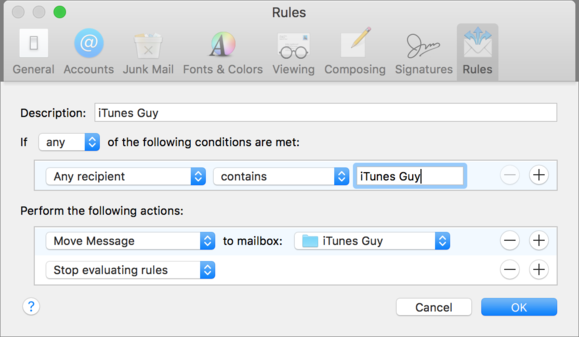 Choose Mail > Preferences, then click Rules. Click Add Rule and then give your rule a name. Choose something from the condition menu, such as From, To, Any Recipient, Date, and more, and enter the text you want to filter. This could be a keyword in the subject, or an email address, or a client’s name. 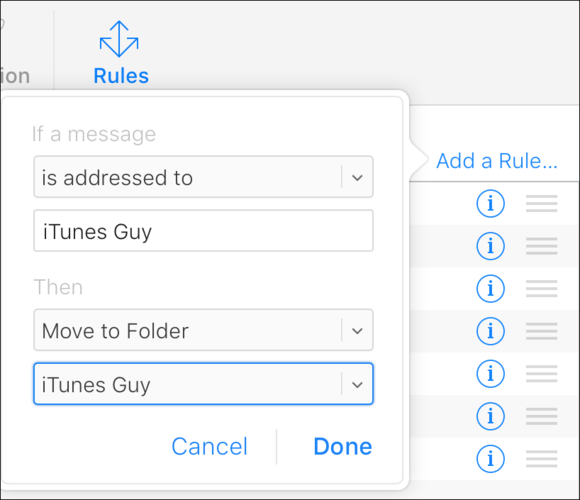 Choose what to do with the message; in the example below, I’m moving messages sent to my iTunes Guy address to a specific folder. And then I add the condition Stop Evaluating Rules, so no other rules affect the message. 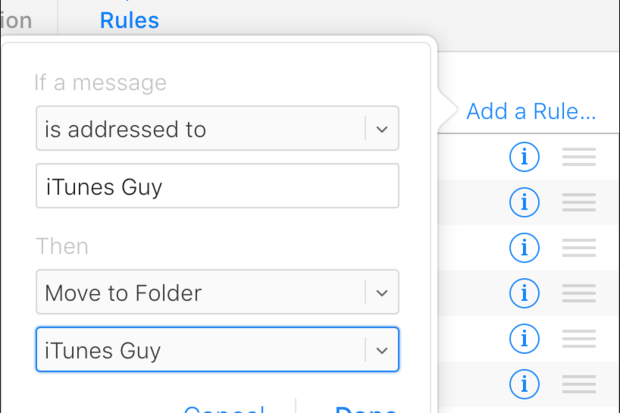 Here’s a simple rule in Mail: it looks for a specific recipient, then moves messages to a folder. For more ideas of rules you can create in Mail, read this article. When you use filtering on your Mac, your email is filtered there as long as the Mac is running, and you’ve got Mail open. Even if you’re not home, if your Mac is on, Mail filters your messages, making it easier to deal with mail on your iOS device. You may not want to leave your Mac running all the time, but if your Mac supports Power Nap, you can let your Mac sleep, and it will check for new email from time to time, and filter it while doing so. To activate this, choose the Apple menu > System Preferences > Energy Saver, and then click Enable Power Nap. To filter messages on iCloud.com, log into iCloud.com on the web. Click on Mail, then click the gear icon at the bottom left of the page. Choose Rules, and then Add a Rule. Choose a condition from the first menu. You can choose who a message is from, who it’s addressed to, CC’d to, or you can have iCloud filter emails that contain specific words in the subject. In the Then menu, you can tell iCloud to move the message to a folder, to the Trash, or forward it to another email address. For the first choice, you then select a folder; for the third option, you enter an email address for forwarding. Filtering messages on iCloud.com means they won’t show up in your inbox, even on your iOS devices. Click Done, and iCloud will filter these messages on the server, placing them in the folder(s) you’ve selected. The advantage to filtering email on the server is that your Mac doesn’t need to be running. 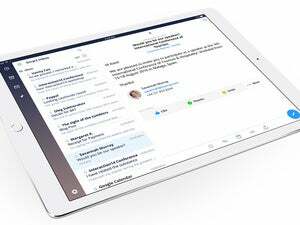 When you check email on your iPhone or iPad, your inbox won’t be as cluttered. You can still access the filtered emails by checking specific folders in Mail on your iOS device, but your inbox won’t contain as many messages. If you use Gmail, you can also filter messages. Click the gear icon, then choose Settings. Click Filters and Blocked Addresses, and then click Create a new filter. Enter the term you want to use in the appropriate field: From, To, Subject, Has the words, etc. Click Create filter with this search, and then choose how you want messages matching this filter to be processed. 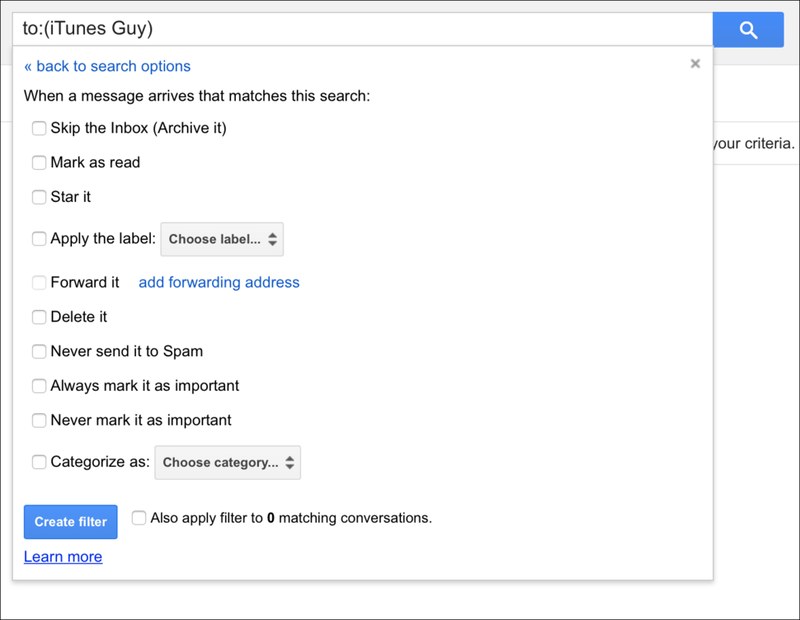 Gmail gives you lots of options for this: the emails can be archived, marked as read, forwarded, deleted, and much more. Click Create Filter to save the filter. 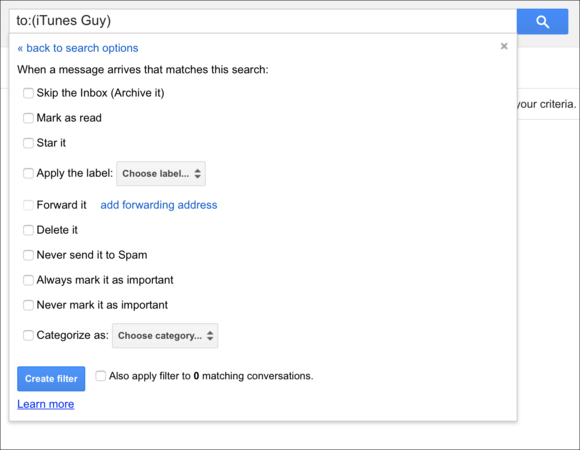 Create a filter in Gmail, and then choose how Gmail processes messages matching your filter. As with iCloud, these server-side filters act on messages before they get to your Mac or your iOS devices. This is useful if you want to keep your iPhone’s inbox from getting overloaded with messages you don’t need to see right away. No matter which method you use, you’ll find that filtering your email can save you a lot of time, and keep your inbox less crowded. Try it out, on your Mac, or on your email server, and see how much easier it can be to deal with email.